These roasted pumpkin seeds are flavored with delicious pumpkin pie spice and are the ideal low carb snack this fall. Around now is the time of year when everyone is starting to carve pumpkins, but don’t miss out on the opportunity for this tasty seasonal snack! 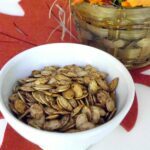 The seeds from the pumpkin can be roasted and become a wonderful crunchy snack that just happens to be low carb and healthy! Here I have mixed the seeds with pumpkin pie spice because, well, it seemed only right! Scoop out the seeds from the pumpkin and pull off all the “guts”. From one large pumpkin I managed to collect about 1½ cups of seeds. 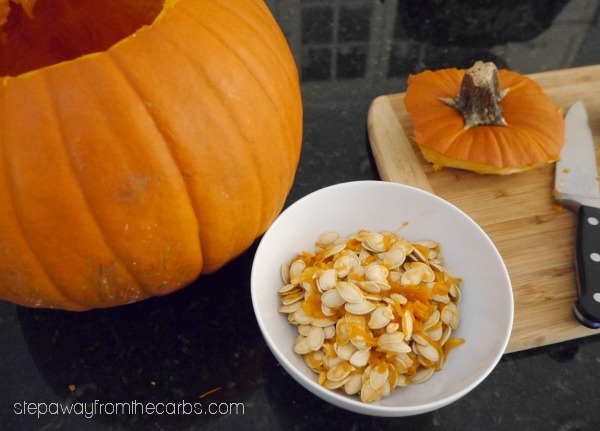 Place the pumpkin seeds in a bowl and cover in warm water. Leave for about 15 minutes and use a slotted spoon to lift out the seeds – this process will soak off any remaining pumpkin. Place the seeds in a saucepan of boiling water, reduce to a simmer, and cook for 10 minutes. This will help even cooking when the seeds are roasting. Drain the seeds. In a bowl, mix together olive oil and pumpkin pie spice. Add the seeds, salt and black pepper, then mix well to coat. 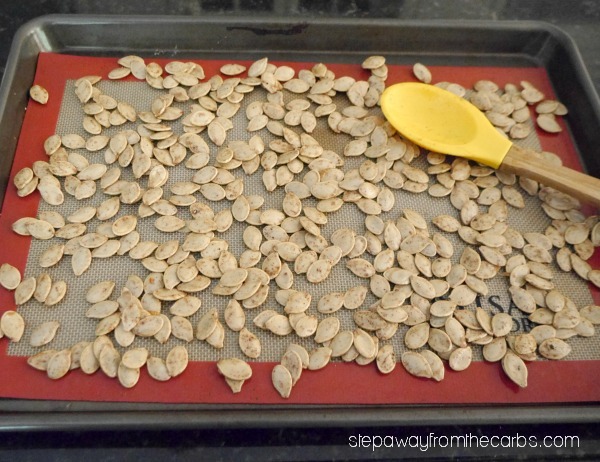 Spread the spiced seeds out onto a baking tray lined with a silicone mat. Roast in a preheated oven for 20-25 minutes, shaking the seeds half way through cooking to turn as many as possible. 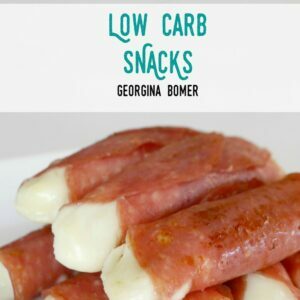 Leave to cool and enjoy this crunchy spiced low carb snack! Remove excess flesh from the seeds and place them in a bowl. Cover in warm water and leave for 15 minutes. Use a slotted spoon to remove them from the water, and place them in a saucepan of boiling water. Reduce to a simmer, and cook for 10 minutes. In a bowl, mix together the olive oil and pumpkin pie spice. Drain the seeds, then add them to the bowl together with salt and pepper. Mix well then spread out onto a baking sheet lined with a silicone mat. Cook for 20-25 minutes, turning once halfway into the cooking time. These sound awesome! I always sneak a bag of pumpkin seeds into the movie theater to keep me away from the popcorn. But I just have salted ones, and the pumpkin spice ones would be a nice change, and awesome for Fall snacking. These look delicious! My kids love pumpkin seeds – they would have so much fun making their own! Yum! I love the idea of pumpkin spiced pumpkin seeds! 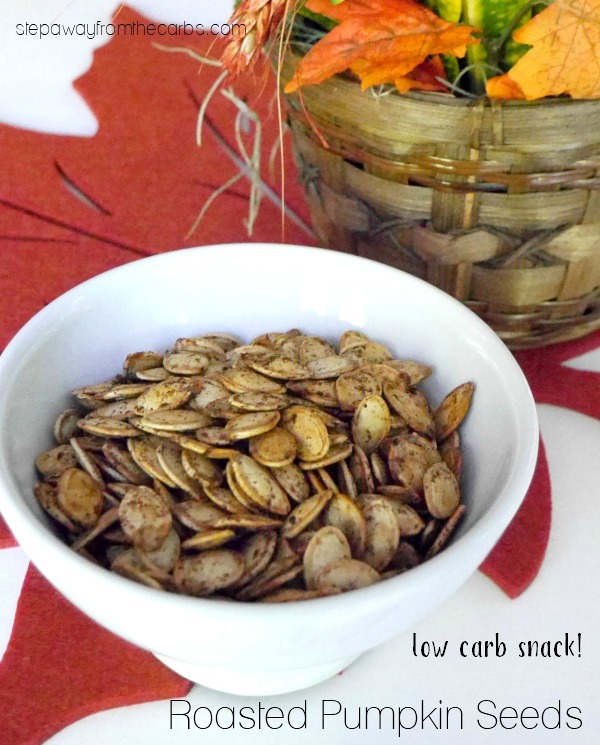 What a great idea to actually use the pumpkin seeds! So far, I’ve always just chucked them in the bin. We’re big at pumpkin carving over here, and that time of the year is just around the corner. I’ll let my kids get on with it while I shall roast and snack on pumpkin seeds! I love roasted pumpkin and squash seeds, Georgina! Unfortunately, I’m the only one in the family who eats them. I usually just rub them in oil and salt them – classic but broing. I can’t wait to try this pumpkin pie spiced version. Thanks! These look delicious! I love roasted pumpkin seeds for a snack. Yummy and healthy too! I love roasted pumpkin seeds. Thanks for sharing!